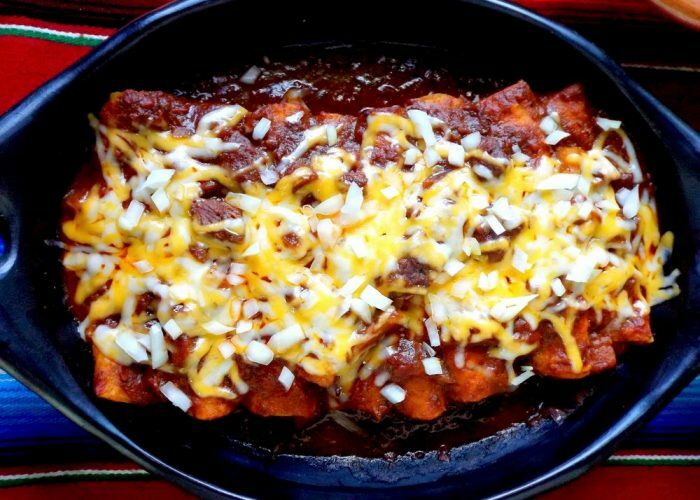 Are you ready to enjoy a big plate of Tex Mex brisket enchiladas? This recipe is a must try for your next big family Sunday dinner! Brisket enchiladas? Yes! 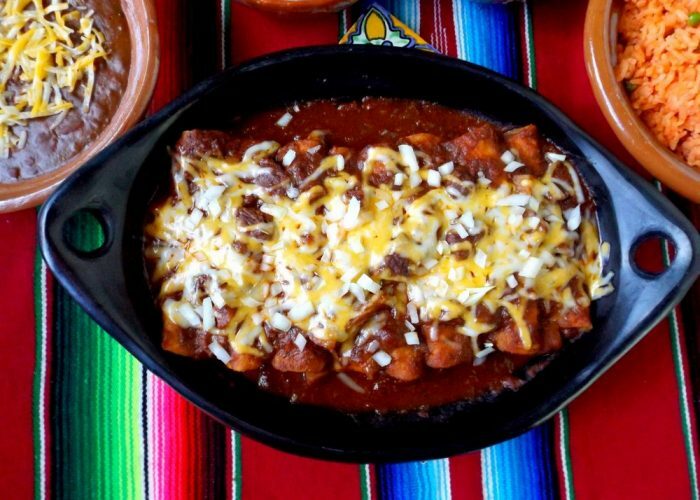 For me, these are the ultimate beef enchiladas! This recipe was inspired by my love of Tex Mex food and the wonderful history of the chili queens of yesterday. It's also an homage to the many trips cross country with my parents through the big state of Texas, where similar plates of brisket enchiladas were served. I really wanted to prepare them as I imagine they would have been served at the old truck stops throughout the Lone Star State. A simple garnish of diced onions as soon as they come out of the oven is all you need. The added potatoes is my spin on the recipe. 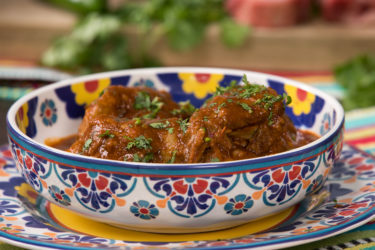 It's a hearty beef and potato dish that can be served on its own with a side of rice, beans and warm tortillas. In a large pot, cook the bacon at medium heat until brown and crispy. While the bacon cooks, season the brisket lightly with equal parts salt and pepper. Remove crispy bacon from the pot and transfer to a plate lined with paper towels. Reserve for later. In that same pot at medium heat, brown the brisket on all sides. You may have to brown it in two batches so that you don't overcrowd the pot. To the seared brisket, add 1/2 of the diced onions, garlic and jalapeños. Season lightly with salt and pepper. Saute for 3-4 minutes. Add crushed tomatoes. Stir well to combine and cook for 5-6 minutes. Add the ancho powder, cumin, paprika, oregano, maggi sauce and 4 cups of beef broth. Stir well to combine. Taste for salt. Braise at a steady simmer, mostly covered, for 1 hour, 45 minutes or until meat is tender. Stir every now and then. Once meat is tender, add the diced potatoes. Add the cooked bacon. Continue simmering for 35-45 minutes or until potatoes are fork tender. Cover and remove from heat. Preheat oven to 350 degrees F.
In a large skillet, add canola oil and preheat on medium for 4-6 minutes. Fry the corn tortillas for about 20-30 seconds per side. Shake off excess oil as you fry them. Place tortillas in between foil paper, mostly covered, until all of them are fried. Let cool slightly. To assemble enchiladas, spoon out a little of the sauce from the chili onto the bottom of a large baking dish; just enough to coat it lightly. Using a small spoon, add 2 tablespoons of beef/potato filling down the center of the fried tortilla. Add some shredded cheese and reserved diced onion. Roll as tight as you can and place seam side down into baking dish with sauce. Try to reserve the sauce when filling enchiladas. To finish, ladle the brisket chili over the top of enchiladas in baking dish. 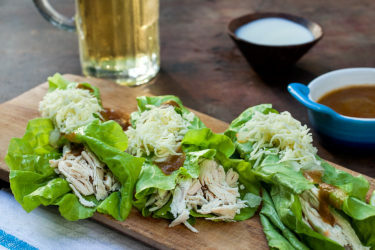 Try spreading the sauce so it covers tortillas generously. Then concentrate the beef and potatoes towards down the center/top of the enchiladas. Add cheese and bake in preheated oven for 25-30 minutes or just until cheese melts. Remove from oven and garnish with more remaining diced onions. Serve right away. 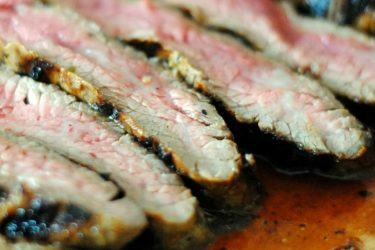 If you wanted to prepare this recipe in the slow cooker, don't skip this step and make sure you sear that beef. It adds so much more flavor! After searing the beef add all your ingredients to the slow cooker. Cook on low for 8 hours. Taste for seasoning as it cooks and stir now and then. Add the potatoes during the last 2 hours of cooking time.